In Guinea-Bissau, savannas dominate the land cover, accounting for about 45 percent of the country’s land surface. Although the total savanna land surface has remained nearly unchanged, the underlying dynamic is not so simple. Agricultural areas have doubled since 1975. Covering 13 percent of the national land surface in 2013, agriculture has become the second most extensive land cover class. Clearing for cultivation has encroached into natural habitats in all of Guinea- Bissau’s ecoregions except the Zone de Colline de Boé (ZCB – Boé Hill or Upland Zone). Whereas agricultural expansion explains the loss of about 2,500 sq km of savannas (or 16 percent of their 1975 total land surface), the degradation of woodlands and forests from logging and clearing has produced open landscapes that take on the characteristics of tree and wooded savannas, increasing the area mapped as savanna in the same period. Deforestation for wood production is responsible for 65 percent of forest habitat losses (forests, woodlands, gallery forests), or 1,700 sq km of forest that have become savannas in 2013. Agriculture in shallows and recession, in particular rice cultivation, colonizes alluvial floodplains in the Zone des Estuaires (E-GB – Estuary Zone) and the Zone Côtière (ZC-GB – Coastal Zone). 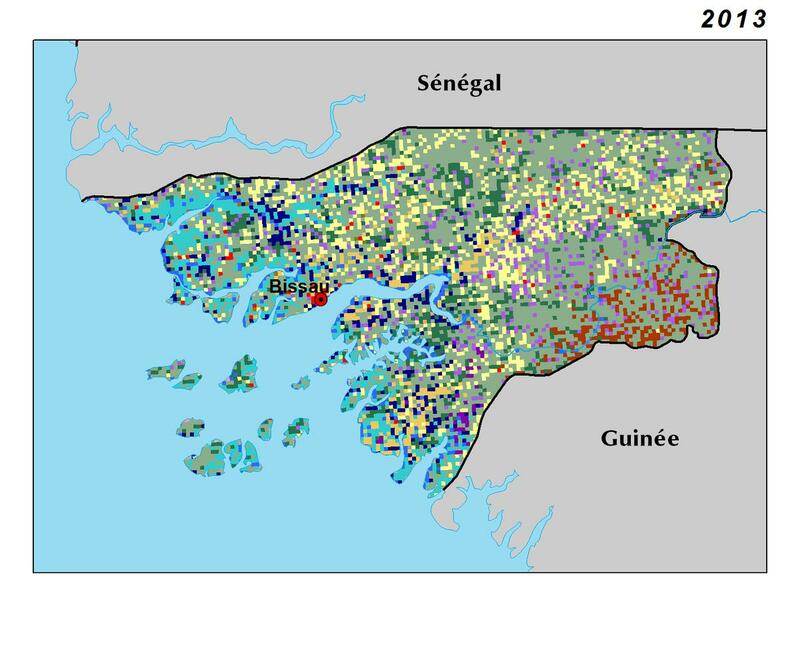 Rice cultivated areas have slightly increased in Guinea-Bissau since 1975, encroaching into wetlands, gallery forest and mangroves. Whether from clearing for cultivation, local harvesting of wood, or for external commercial markets, the forest resources have been heavily degraded by rapid exploitation. The rate of deforestation has increased from about 2 percent per year between 1975 and 2000 to 3.9 percent over the 2000 to 2013 period. 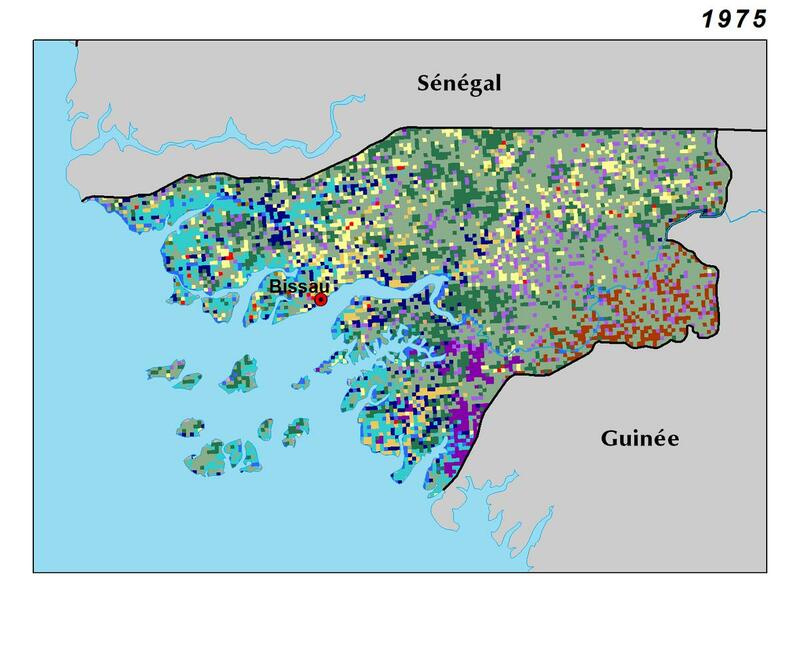 Overall, Guinea-Bissau lost about 77 percent of its forests between 1975 and 2013; only 180 sq km remain, mainly in the south near the Guinea border. Likewise, woodlands regressed by 35 percent over the 38 years, a loss of 1,750 sq km. Mangroves are one of the major land cover classes in Guinea- Bissau, accounting for over 9 percent of the country’s land surface. This fragile ecosystem is critical to coastal people who take advantage of its rich fisheries and wood resources. They also use the tidal flats for traditional rice cultivation (Corcoran, Ravilious, and Skuja, 2007). Between 1975 and 2013, mangroves decreased by 6.4 percent, or 220 sq km. Bowé, lateritic landscapes that characterize Guinean plateaus, cover 3.2 percent of the country’s land surface and are mainly found in the Colline de Boé (ZCB – Boé Hill or Upland Zone) ecoregions. These rocky, impenetrable soils are usually devoid of woody vegetation but support a herbaceous cover during the rainy season. As a result, bowé is one of the most stable landscapes in Guinea-Bissau. Bowé is ill-suited to agriculture but conducive to grazing.